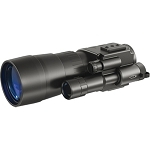 The 3.5x56 Challenger Gen 2 Night Vision Monocular from Pulsar is a multi-purpose NVD featuring a second generation image intensifier, built-in infrared illuminator, accessory rail, and two 1/4"-20 threaded mounts. The Gen 2 intensifier tube is protected from excessive light levels and prevents damage to the viewer's eye by automatically deactivating the device when exposed to a bright light source. Two mounting options allow the observer to tripod-mount the monocular or attach it to head gear for long-duration viewing. 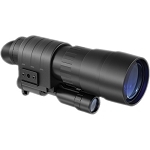 Included with the Challenger NVD is a 100mW infrared illuminator that will enhance detail of the viewed image and extend the visible range of the monocular as well as enable the observer to see in pitch darkness. 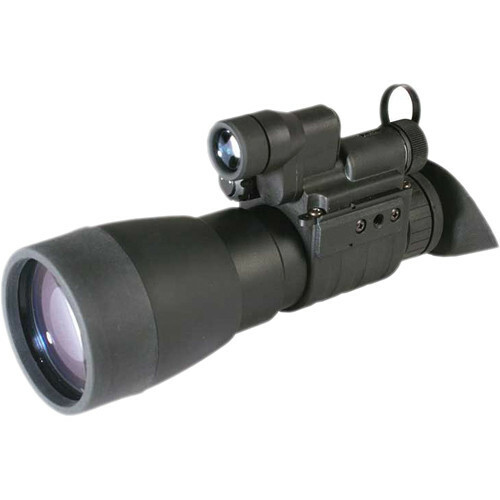 Additional functionality is provided by an integrated Weaver rail for attaching a long-range IR illuminator or other NV accessory. This configuration of the Challenger is equipped with a 3.5x lens system that transmits a 12° angle of view and is capable of being focuses as close as 5 ft. A 56mm objective lens allows the optical system to gather adequate light to create a night vision image that is rich with detail and contrast. 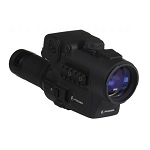 The Challenger's 40lp/mm minimum resolution renders more than enough detail for recreational viewing and surveillance tasks. Powerful IR illuminator is useful for observation in low levels of natural illumination, at longer distances. The Challenger G2+ is fitted with a new five lens eyepiece that minimizes distortion across the edges of the field of view and increases image sharpness and contrast. A soft rubber eyecup conceals the light emission from the tube thus permitting a user to stay unnoticed. When rotating the eyepiece, the eyecup remains fixed. Two diametrically positioned mounting rails with a ¼” tripod mount. Additional Weaver rail on the body is designed to install extra Pulsar IR Illuminator or other accessories. Black spots can be visible in the field of view of the NV monocular 74093B (Challenger G2+ 3.5x56B), which is compliant with the technical requirements of the tube EPM223G-11-26V and is not a defect.